In the animal kingdom, certain behavior does not need to be learned – for example most animals will automatically run away from the sound of a rattlesnake’s rattle, even if they had never encountered one before. Animals at a waterhole know which approaching sounds are benign and which indicate a predator’s approach. These behaviors are known as instinct. Do humans also have instinctual fears? Why is it that so many people are afraid of snakes, spiders, crocodiles/alligators. Numerous studies – evolutionary and psychological have suggested that many fears are shared by all mammals, dating back to a time when they had to survive and breed in dangerous places that housed these and other predatory species. For example, both snakes and spiders were known to have killed simians over 20 million years ago in what are now African jungles. Crocs still kill unwary chimpanzees today. If that is the case why do only some of us retain these fears? Why do others not only like these creatures but also search for the on the edge of fear experience? There is a simple explanation that this depends on particular personality traits. There are the adventure seekers who need a lot of stimulation and those called “neophobes” who fear anything new. I suppose I fit somewhere in between those two personality classifications. I do enjoy going out of my comfort zone to a certain degree as you have read here, here and here . Most of the time it is a personal decision to push myself. Once in a while though, I am kind of forced into it. While I am somewhat mollified to learn that I am not the only one with this fear, I have not yet figured out where it came from. I haven’t read any research on proto-humans or humans being constantly attacked by simians in evolutionary history so I don’t think it is instinctual. I have never been personally accosted by one either. In fact I have, for as long as I can remember gone out of my way to avoid them. During my career as an advertising executive, for example we often were given presentations of potential television programs that included animals. Most of these I thoroughly enjoyed. However, when someone (yes even Jim Fowler of “Wild Kingdom” fame) arrived with a chimp or orangutan, I fled to my office and locked the door. Then came an offer I could not refuse. It started innocently with an invitation to watch the filming of a Mark Burnett pre-cursor to the reality show “Survivor.” It was called “Eco-Challenge” The contestants were men/women teams of world-wide über athletes who were to participate in a series of extremely grueling land and water races for 24 straight hours over a 300-mile course, including hiking, whitewater canoeing, horseback riding, sea kayaking, scuba diving, mountain climbing and biking. The place? Sabah, Malaysia. 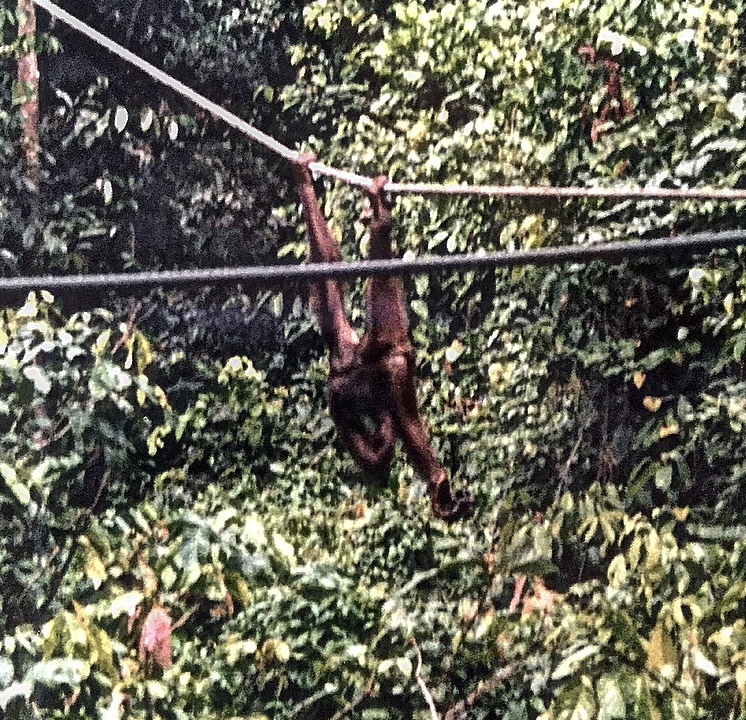 In addition to watching the race I also had a chock-full itinerary of activities: off-road riding in a 4WD truck, jungle river cruising, canopy climbing and zip-lining in the rainforest, white water rafting, visiting sacred shrines and cultural villages. 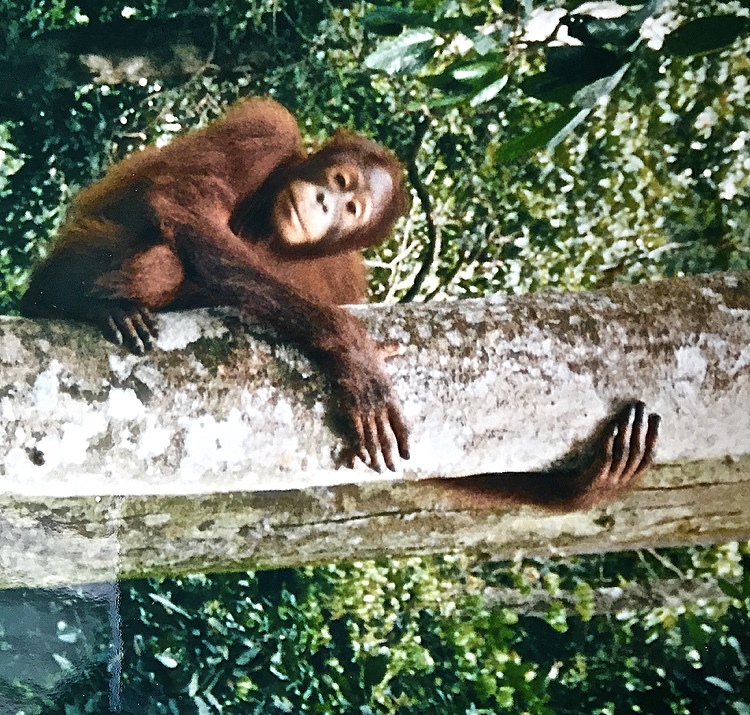 Then there was the Sepilok Orangutan Rehabilitation Center. 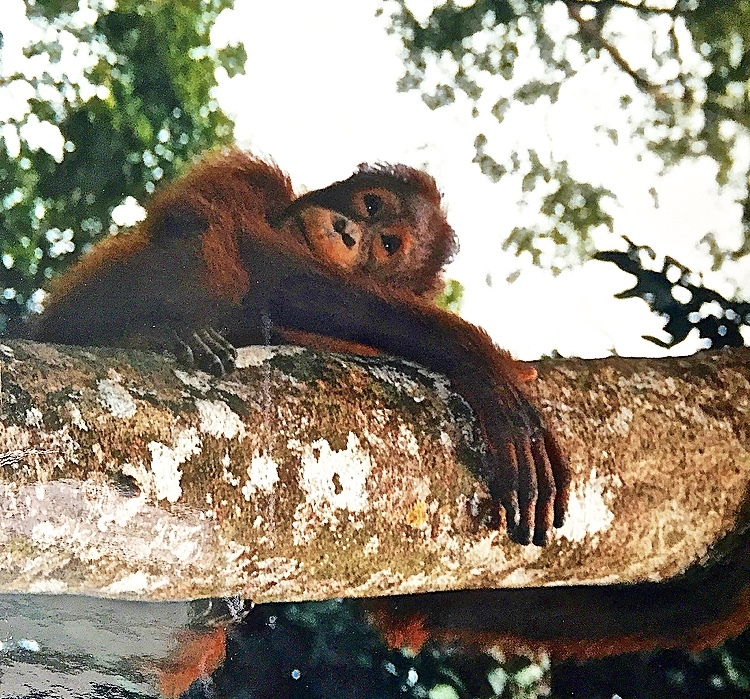 This sanctuary enables visitors to come into close contact with the orangutans and watch then as they learn to fend for themselves in the wild. 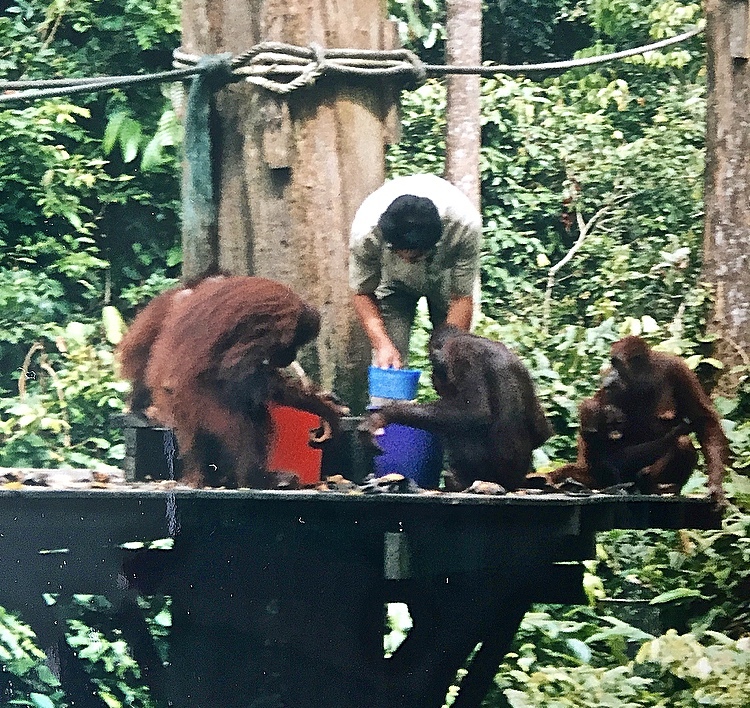 As they are learning, they are also given some help in twice daily feedings of bananas and milk on a platform set in the jungle. Easy peasy? 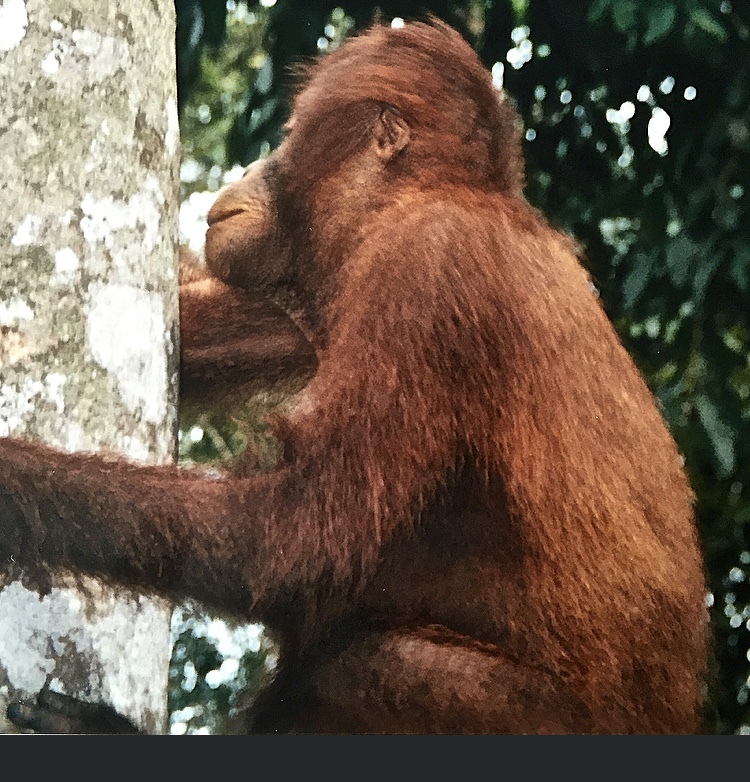 Did you notice the phrase “This sanctuary enables visitors to come into close contact with the orangutan” above? If this was the extent of the view, that would have been fine. However when I first read the itinerary and saw the word “close” I went into a panic. 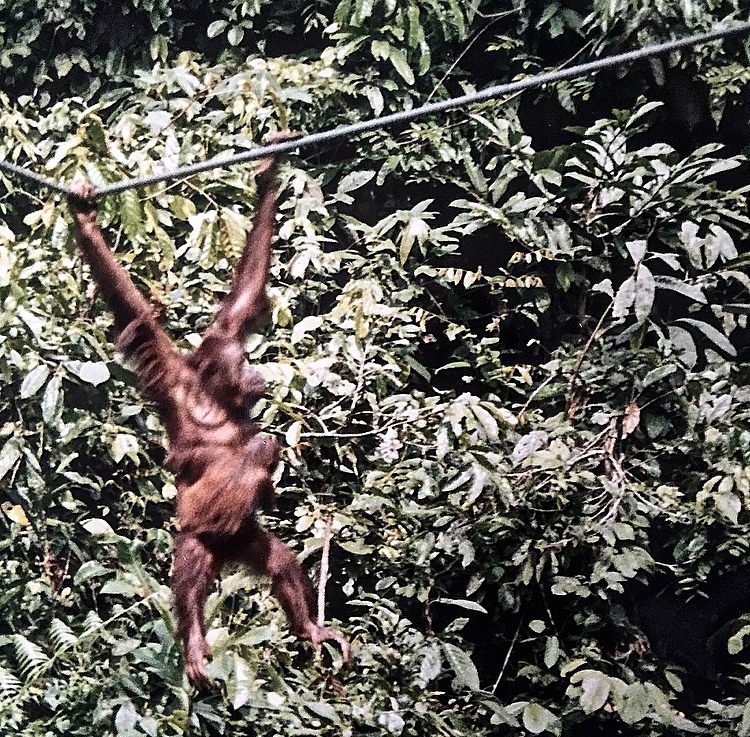 These orangutans roam free – they can go ANYWHERE they want. Okay, I thought – I can protect myself from being touched by these creatures and proceeded to dress accordingly – long pants, shirt, sweatshirt with hood, hat and bicycle gloves. There! my skin is covered. Did I mention that this is Malaysia? In the jungle the heat and humidity are both around 100 degrees. Within minutes of entering the facility my body started to heat up, my face turned red and sweat started pouring down. Notice that woman laughing in the background? She obviously had no sympathy for the terror in my eyes. So much for relying on the kindness of strangers. 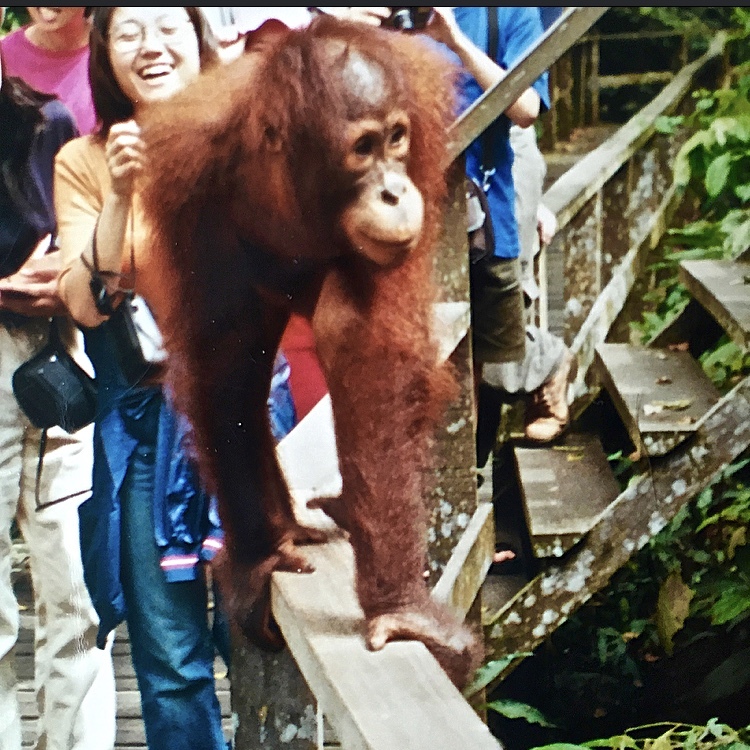 This entry was tagged ANIMALS, borneo, facing fears, MALAYSIA, ORANGUTAN, PHOTOGRAPHY, Pithecophobia, sabah, Sepilok Orangutan Sanctuary, SURVIVOR, TRAVEL. Bookmark the permalink.